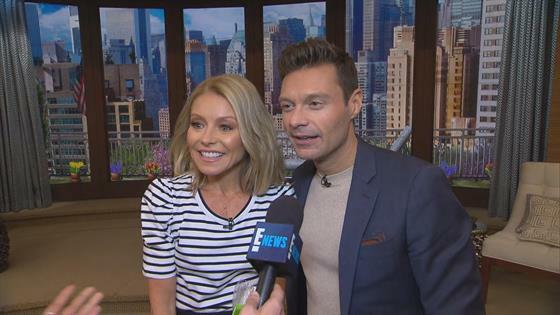 Kelly Ripa & Ryan Seacrest Celebrate 1 Year of "LIVE"
Mornings have never looked brighter for Kelly Ripa and Ryan Seacrest. One year after the close friends became co-hosts on LIVE With Kelly and Ryan, audiences across the country have fallen in love with the pair's segments, life stories and undeniable chemistry. And when chatting with E! News during their anniversary week, the pair couldn't believe that 12 months had already passed. "On the one hand, it feels like Ryan has always been here because he's been such a big part of my life off camera for the past 15 years so it feels like he's always been here in a sense. On the other hand, it feels like he got here three days ago and we're already celebrating a year," Kelly shared with E! News on the LIVE set in New York. "I posted it on Instagram last night, but time really does fly when you're having fun. It's been the fastest year of my life." Ryan took it one step further and proclaimed it's been "the best decision of my life." "To spend time with this woman whom I've known for a long time, but never as often or frequent, and I literally get up excited every morning to see her and the fact that we get to chat and catch up on national television and this is a job, it's a dream," he explained. Because they spend every morning together, the duo has learned quite a few new things about each other. According to Ryan, Kelly's post-show snack is no longer a slice of toast and avocado. Instead, she's obsessed with a peanut butter powder that she puts into water. As for Kelly, she can't believe the American Idol and iHeartRadio radio host is good at humming a song. "I learned he's an amazing singer. He really is. I don't know if it's years of being exposed to amazing singers or the radio but he's a great singer," Kelly explained. "There is so much more to him than just a consummate profession who's an incredibly gifted broadcaster. He's got so many gifts." As the pair continues to help wake up America weekdays, both morning veterans are looking forward to more unexpected LOL-worthy moments both on and off screen. And yes, Ryan may be interested in building an even stronger friendship with Kelly's husband Mark Consuelos. "I think the fact that her husband and I have grown so close has been one of the greatest things for me. We're actually wearing the same clothes these days. I'm trying to morph into Mark Consuelos the best I can," the founder of Ryan Seacrest Distinction joked to E! News. "When he has a workout, I want to have a workout. It's that kind of relationship. Matter of fact, Mark invited me to dinner tonight." Can't wait to hear how it went when LIVE with Kelly and Ryan airs weekday mornings. Check your local listings here.